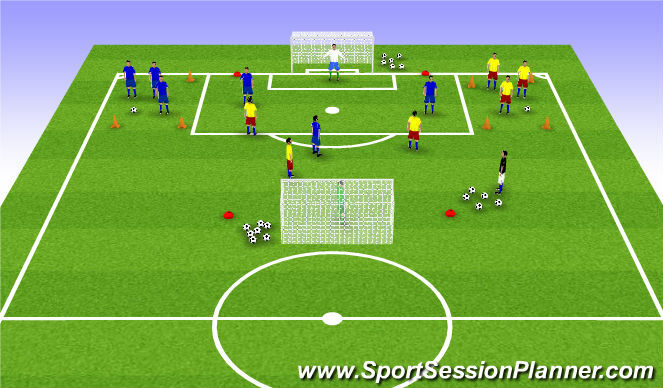 >> 2 group of 6 players position themselves in a grid of approx 40m x 40m. >> The blue players move freely in the grid and passing among themselves. >> The blue players must actively ask for the ball, check off, anticipate etc. >> The yellow players "PRESSURE" the ball wihtout intercept. (semi defending). >> Change the role of the blue and yellow team regularly. >> DYNAMIC STRECHES IN THE BREAKS. 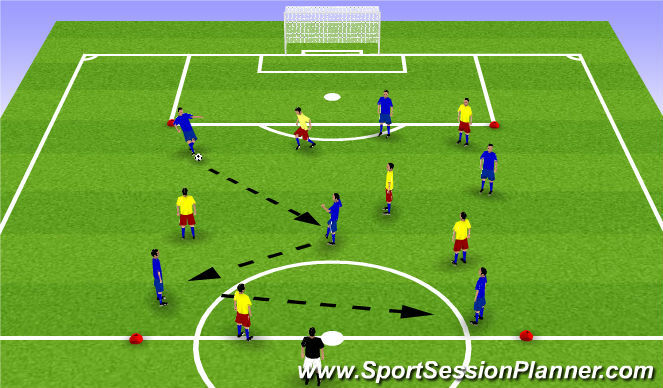 >> Use the same grid from the warm up passing session. >> One team keep possession of the ball while other team tries to win it back. >> Series of 3-4 minutes maximum with 2 minutes rest in between. >> Make the grid biiger/smaller. >> A field of approx 30mx25m with 2 big goal and plenty of balls next to the goals. >> The Coach with the balls on the side line. 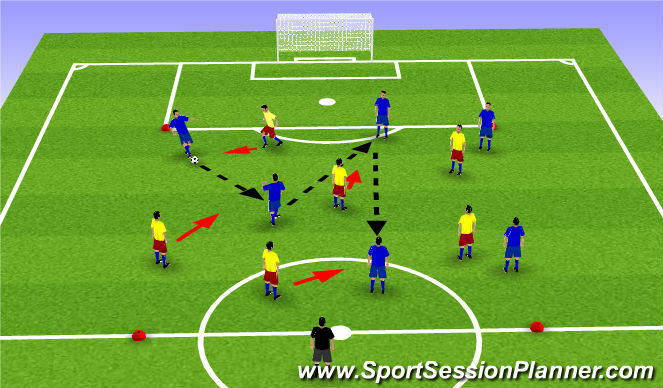 >> The team in possession must keep a diamond shape to make combination play possible. >> The attackers can score from any position on the field, therefore the defence must mark closely and defend aggresively everywhere. 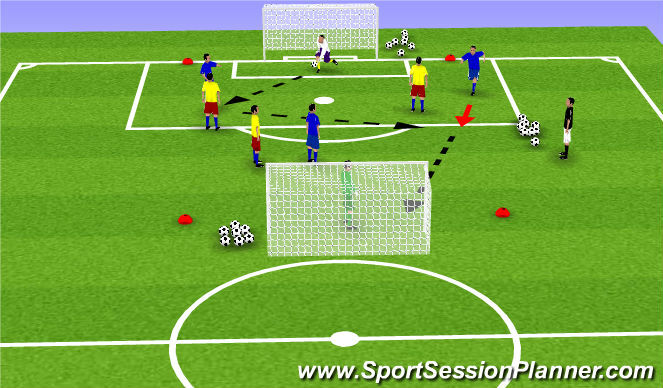 >> There are no stops from throwins,corners,freekick or goal kick. >> The goal keeper of the team that should have had the throw in,corners or free kick immediatly feeds a new ball. (with 3seconds otherwise the Coach feeds a ball to the other team). >> PLAY 10 GAMES OF 1 MINUTES WIHT 3 MINUTES REST BETWEEN THE GAMES. >> The rest period must be a "ACTIVE REST" !!!! >> This is allow intensity activily like juggling individually or as a group.